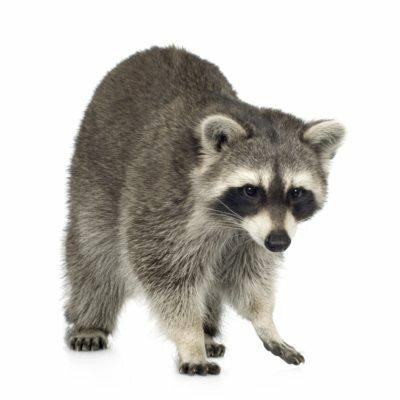 Home / Modern Pest Blog / Are Raccoons Moving Into Your Attic? Are Raccoons Moving Into Your Attic? When fall days get shorter and colder, raccoons, mice, and squirrels know that it’s time to start preparing food and shelter for the winter months. They do not hibernate in winter, and the warmth and security of your walls and attic make your home the perfect winter den. While ideal for them, for you it means damage to your home and health risks for your family. In our three-part blog series Autumn’s Unwelcome Guests, we’ll look at how raccoons, mice, and squirrels get into your home, the damage they cause, and the health risks they pose. And of course, how Modern Pest’s Wildlife Control Team and Homecare Green program can help you get these critters out of your house and back to nature. Raccoons love to cozy up in attics. Have you heard loud thumping and walking noises in the night? Are there unexplained growls, cries, and chirps coming from upstairs? You probably have raccoons. Think you might have raccoons residing in you attic? Call Modern Pest today for a site evaluation before it gets out of control! Raccoons eat a wide variety of foods to store up layers of body fat for winter. A raccoon might cover 3-5 miles on a fall night and eat as much as 5 pounds of food to build up this fat. Raccoons don’t hibernate, but they sometimes stay in their dens for weeks at a time during extreme weather. They live off their stored body fat during this time. Raccoons particularly love to make shelters in attics. Attics are usually warm, dry, safe, and protected from the weather. Female raccoons love safe and enclosed areas to give birth and raise their pups in. Attics are also close to human food sources like pet food and garbage cans. Attics are practically a raccoon bed & breakfast. Raccoons are great climbers and have few problems entering an attic. A home with holes or open areas is easily accessible. Trees adjacent to homes also make it easy for raccoons to climb up and get in. They can climb almost any surface and don’t need much to grab on to. They’re also very strong and can rip through shingles and wooden roofs. Other common access points are soffits, vents, and anywhere an eave meets up with the roof. They’re also known to climb down chimneys. Once they’re in, raccoons will start to destroy your home. There is really no limit to the damage these large and strong animals can do. Raccoons crush your insulation by walking and laying on it, and by moving it around to make sleeping areas. This reduces the efficiency of the insulation. Raccoons chew through electrical wiring, creating fire hazards and costly repairs. Raccoons tear apart heating and cooling ducts, reducing the effectiveness of HVAC systems. Raccoons urinate and defecate everywhere, soiling insulation, wood, and ductwork. Their waste also creates health risks for humans and pets. Modern Pest’s Wildlife Control Team can solve your raccoon problem. Call us today at 1-800-323-PEST for more information! In addition to severe damage, raccoons present several health risks to humans. Rabies is commonly carried by raccoons and is spread from an infected raccoon to a pet or human through saliva via a bite or scratch. It causes muscle pain, dizziness, fatigue, fever, delirium, aggression, and eventually death if not treated in a timely manner. Leptospirosis is a bacteria spread through feces that can cause fever, headache, chills, muscle aches, jaundice, and kidney or liver failure. Salmonellosis bacteria causes abdominal pain, cramping, diarrhea, and vomiting. It can often lead to hospitalization. Giardiasis bacteria causes gastrointestinal discomfort that includes bloating, vomiting, indigestion, and loss of appetite. Parasites infecting raccoons include roundworms, flatworms, tapeworms, mange-causing mites, lice, and fleas. Attempting to remove raccoons from your home yourself can be risky. Raccoons are aggressive when they feel threatened and could bite or scratch. A raccoon attack could lead to some of the health risks outlined above. Often, it’s a female raccoon and her young in an attic. If the mother is trapped and relocated, then the babies will suffer and starve to death. It is extremely important that the babies are removed and relocated along with the mother. Since this isn’t easy work, it’s best to call a professional like Modern Pest Services’ Wildlife Control Team. If you think you have a raccoon issue, call Modern Pest today at 1-800-323-PEST to schedule a site evaluation. Or click here to learn more about Modern’s Wildlife Control Services.